This article is about the commercial enterprise. For the band, see Farmers Market (band). For the album by Art Farmer, see Farmer's Market (album). For the online black marketplace, see The Farmer's Market. A farmers' market is a physical retail marketplace intended to sell foods directly by farmers to consumers. Farmers' markets may be indoors or outdoors and typically consist of booths, tables or stands where farmers sell fruits, vegetables, meats, cheeses, and sometimes prepared foods and beverages. Farmers' markets exist in many countries worldwide and reflect the local culture and economy. The size of the market may be just a few stalls or it may be as large as several city blocks. Due to their nature, they tend to be less rigidly regulated than retail produce shops. They are distinguished from public markets, which are generally housed in permanent structures, open year-round, and offer a variety of non-farmer/non-producer vendors, packaged foods and non-food products. The current concept of a farmers' market is similar to past concepts, but different in relation to other forms – as aspects of consumer retailing, overall, continue to shift over time. Similar forms existed before the Industrial age, but often formed part of broader markets, where suppliers of food and other goods gathered to retail their wares. Trading posts began[when?] a shift toward retailers who sold others' products more than their own. General stores and grocery stores continued that specialization trend in retailing, optimizing the consumer experience, while abstracting it further from production and from production's growing complexities. Modern industrial food production's advantages over prior methods depend largely on modern, cheap, fast transport and limited product variability. But transport costs and delays cannot be completely eliminated. So where distance strained industrial suppliers' reach, where consumers had strong preference for local variety, farmers' markets remained competitive with other forms of food retail. Starting in the mid-2000s, consumer demand for foods that are fresher (spend less time in transit) and for foods with more variety—has led to growth of farmers' markets as a food-retailing mechanism. Farmers' markets can offer farmers increased profit over selling to wholesalers, food processors, or large grocery firms. By selling directly to consumers, produce often needs less transport, less handling, less refrigeration and less time in storage. By selling in an outdoor market, the cost of land, buildings, lighting and air-conditioning is also reduced or eliminated. Farmers may also retain profit on produce not sold to consumers, by selling the excess to canneries and other food-processing firms. At the market, farmers can retain the full premium for part of their produce, instead of only a processor's wholesale price for the entire lot. However, other economists say "there are relatively few benefits in terms of energy efficiency, quality or cost ... fun though they are, are not good economic models." Some farmers prefer the simplicity, immediacy, transparency and independence of selling direct to consumers. One method noted by the special interest group Food Empowerment Project promotes community-supported agriculture programs (CSAs). In this scheme, consumers pay farms seasonally or monthly to receive weekly or biweekly boxes of produce. Alternatively, they may be required to pay for an entire season’s worth of produce in advance of the growing season. In either case, consumers risk losing their money if there is a crop failure. Due in part to the increased interest in healthier foods, a greater desire to preserve local cultivars or livestock (some of which may not be up to commercial shipping or yield standards) and an increased understanding of the importance of maintaining small, sustainable farms on the fringe of urban environments, farmers' markets in the US have grown from 1,755 in 1994 to 4,385 in 2006, to 5,274 in 2009, to 8,144 in 2013. In New York City, there are 107 farmers' markets in operation. In the Los Angeles area, 88 farmers' markets exist, many of which support Hispanic and Asian fare. In the U.S., all levels of government have provided funding to farmers' markets, for instance, through the federal programs , , , and . The programs primarily subsidize purchases at farmers' markets by low-income residents. Examples include Austin's Double Dollar Incentive Program, Boston's Bounty Bucks, Chicago's LINK Up, Columbia Heights Festibucks in Washington, D.C., Fresh Checks in East Palo Alto, Market Match in Los Angeles, Michigan's Double Up Food Bucks, New York City's Health Bucks, Portland Fresh Exchange, and Seattle Fresh Bucks. These programs often rely in part on nonprofit support. The traditional public markets in Chinese cities are known as "wet markets" (菜市场) where most vendors are resellers. The Chinese government has attempted to transform these traditional markets to supermarkets in urban renovation projects. It has led to a decline of these markets in some cities such as Shanghai. Yet, in other cities, wet markets persist and dominate the retail of fresh produce and meat. Because of its critical role in ensuring urban food security, wet markets receive various supports from the local government. After 2010, farmers' markets in China were reborn in some major cities such as Beijing, Shanghai, Guangzhou and Chengdu amidst the food safety crisis. These farmers' markets (农夫市集) provide venues for local small ecological farmers to sell their produce within the city, catering urban middle-class's growing demand for high quality food. Many of these market vendors are operating community-supported agriculture. Meat products at farmers' markets being sold by resellers will include a "distributed by/packed for", or similar, statement on the labels of their meat products. Conversely, meat products being sold at farmers' markets that are prepared and packaged by the selling vendor will not include a "distributed by/packed for", or similar, statement. The official inspection legend includes an establishment number (EST) that identifies the last company that did the processing/butchering, packaging, and labeling of the product. Since the label includes the "distributed by/packed for" statement, the meat may come from the livestock of other farmers/ranchers or a corporate feedlot. The presence of a government inspection legend identifies a meat product that was not processed and packed by the selling vendor. Meat products prepared and packed by the selling vendor or butcher will not include a government seal, and will not include any type of statement that classifies the vendor as a reseller/distributor. The labels on retail beef and pork products that originate a vendor’s/rancher’s livestock will not include the "distributed by/packed for/prepared for” statement. Note that the label will still have an official/government Inspection Legend that identifies the establishment that performed the slaughtering, butchering, packaging, and labeling because any product leaving a slaughterhouse to be sold for human consumption must have a government inspection legend. For example, a label that does not have a "distributed by/packed for", etc. statement ensures the buyer that, while the vendor did not do the butchering/packaging/etc., the meat did originate from the vendor’s livestock. The label on a meat product that is processed and packed by the selling vendor will not include a government inspection legend and it will not include a "distributed by/packed for" statement. Retail cuts of meat products sold by a vendor that performs its own butchering, packaging, and labeling will not include a government inspection legend or a "distributed by/packed for" statement on the label. In such cases the vendor/butcher gets the carcass or other major cuts of meat from a government inspected slaughterhouse and does the secondary butchering ("fabrication"), packaging, and labeling in its own facility. A government official inspection legend is not required on a package of meat butchered and packaged by such a vendor because it is sold directly to the consumer. Most processed meat products (sausage, bacon, hot dogs, frankfurters, snack sticks) sold at farmers' markets have labels that include a "distributed by/packed for/etc." statement as well as a government inspection legend. The government inspection legend includes an establishment number (EST #) that identifies the commercial processing plant that made and packaged the products; similar to a package of sausage or bacon sold in supermarkets. Alternately, a processed meat product sold at a farmers' market that does not include a "distributed by/packed for/etc.” statement and a government inspection legend is a product that is made and packaged by the selling vendor. There are also vendors that sell processed meat products that include a government inspection legend without a "distributed by/packed for/etc.” statement; such vendors are selling co-pack products in which the maker/producer prepares and packages the product according to the vendors’ recipe. Wholesale processed meat products that are resold at farmers' markets are known as "private label" products. Such products will include a "distributed by/packed for/etc.” statement plus a government inspection legend that provides a number that identifies the product's producer. The numbers of critics of private label products are increasing as consumers become aware of poor practices often employed by the products' producers. It is not unusual to find distributors/resellers of processed meat products at farmers' markets because wholesale products allow vendors to minimize their investment by not having to pay for the overhead (knowledge, skills, equipment, supplies, maintenance, food safety inspections, packaging, labeling, etc.) required to produce their own products. A wholesale package of processed meat will bear a label that has a government inspection legend. The inspection legend will usually have an Establishment Number (EST #) that identifies the processing plant that made and packaged the product. Additionally, the package will contain a phrase similar to "distributed by: Steve’s Family Meat Company" or "packed/prepared for Steve's Family Meat Company” somewhere on the label. Both the producer (identified by the EST. # in the inspection legend) and distributor/reseller (for example Steve’s Family Meat Company) will be identified on the label. It will not include a government inspection legend or seal. Ideally, farmers' market produce and fruit are normally grown within a geographical region that is deemed local by the market's management. The term "local" is defined by the farmers' market and usually represents products grown within a given radius measured in miles. Many farmers' markets state that they are "producer only" markets, and that their vendors grow all products sold. Some farmers' markets do not use the term "producer only" and may allow resellers of produce, fruit, and other food products. Of late, many shops in farmers markets in USA and Canada have been found to sell fruits and vegetables not sourced from farms. Instead, they are purchased directly from the local wholesalers and then sold at a marked up price, in the guise of local farmers produce. In September 2017, a hidden camera investigation by the Canadian Broadcasting Corporation found that while some of the stalls at Toronto's Peterborough farmers markets were genuinely run by local farmers, other stalls in the same market simply purchased produce from the wholesale market and sold it without the original stickers at 50% above the retail prices. Tampa Bay Times food critic and investigative reporter Laura Reiley found that many vendors at local "farmers' markets" were actually selling rejected produce from local wholesale markets, or selling produce purchased from non-local sources. In some cases they claimed to sell products from their own farm at first, but when pressed admitted that they had grown none of the products for sale. In at least one case despite vendor claims to the contrary the farm in question was not growing any food, and the produce was all purchased from other companies. In many cases fraud is obvious because the type of food being sold does not grow locally or is out of season. Federal regulations in the United States require country of origin labelling for produce at supermarkets but not for small independent vendors. The Tampa Bay Times also found that packaged foods, such as sauces, honey, jam, and beef jerky may appear to be from local vendors due to the local company's branding on the packaging, but are actually produced at co-packer plants with non-local ingredients. In the United States, the FDA requires that the manufacturer's name and address be listed on the food label, which can reveal this discrepancy. According to a study in the American Journal of Agricultural Economics, farmers markets increase the number of outbreaks and cases of food-borne illness, norovirus, and campylobacter. ^ a b "'People are being duped': CBC exposes homegrown lies at farmers markets". CBC News Canada. 29 September 2017. Retrieved 15 November 2017. ^ a b "Public markets differ from farmers markets". MIchigan State University. ^ "The Difference Between Public Markets and Farmers Markets". 7th street public market, Charlotte NC USA. Archived from the original on 2014-04-07. ^ "Local Food May Feel Good, But It Doesn't Pay". All Things Considered. March 18, 2013. ^ "Farmers' Markets". Cotati, CA: Food Empowerment Project. Retrieved July 14, 2017. ^ Robinson, J. M., and J. A. Hartenfeld. The Farmers’ Market Book: Growing Food, Cultivating Community. Bloomington: Indiana University Press, 2007. ^ Romanienko, Lisiunia. Dual Labor Market Theory and the Institutionalization of Farmers Markets: Marginalized Workers Adapting to Inhospitable Conditions in Louisiana. Journal of Interdisciplinary Economics, 12(4):359-73 2001. ^ Halweil, Brian, and Thomas Prugh. Home Grown: The Case for Local Food in a Global Market. Washington, DC: Worldwatch Institute, 2002. Print. ^ "Agricultural Marketing Service - Farmers Markets and Local Food Marketing". ^ Black, Jane (October 2, 2009). "Number of Farmers Markets Mushrooms". Washington Post. ^ "404 - File or directory not found". www.agriculture.ny.gov. ^ "Farmers Markets in Los Angeles, California". Archived from the original on 2014-03-29. ^ a b c Donovan, Jeanie; Madore, Amy; Randall, Megan; Vickery, Kate (2016). "Best Practices & Challenges for Farmers Market Incentive Programs: A Guide for Policymakers & Practitioners". The Graduate Journal of Food Studies. 1 (1). ^ "Representing Local Foods in the UK". ^ Holloway, Lewis; Kneafway, Moya (2000). "Reading the Space of the Farmers' Markets: A Preliminary Investigation from the UK". Sociologia Ruralis. 40 (3): 285–299. doi:10.1111/1467-9523.00149. ^ "FOOD SAFETY - Overview - European Commission". 8 April 2011. Retrieved 3 February 2016. ^ Zhang, Qian Forest and Pan, Zi. (2013). The transformation of urban vegetable retail in China: Wet markets, supermarkets and informal markets in Shanghai. Journal of Contemporary Asia, 43(3): 497–518. ^ "False Claims, Lies Caught on Tape at Farmers Markets". NBC Southern California. ^ "Code of Federal Regulations Title 9, part 317, section 2" (PDF). ^ "Farmers' Market". Archived from the original on 2011-07-20. ^ "Regulations for Specific Products" (PDF). Washington State Department of Agriculture. Archived from the original (PDF) on 2010-11-03. ^ "Meat Processor Survey Results - Developing Producer & Small Processor Owned Meat Marketing Enterprises" (PDF). Agricultural Marketing Resource Center. ^ "Food Standards and Labeling Policy Book" (PDF). United States Department of Agriculture. Archived from the original (PDF) on 2011-02-05. Retrieved 2011-04-10. ^ "CFR - Code of Federal Regulations Title 21". Retrieved 3 February 2016. ^ a b "CFR - Code of Federal Regulations Title 21". Retrieved 3 February 2016. ^ "Code of Federal Regulations Title 9, part 303, section 1" (PDF). ^ "Welcome to StoreBrands - StoreBrands". StoreBrands. Archived from the original on 2011-04-08. ^ "Private Label". Archived from the original on 2011-01-01. ^ "Do You Know What's In Your Organic Beef? The TFT Reader Investigation Continues... - The Faster Times". The Faster Times. Archived from the original on 2010-05-24. ^ "Durham Farmers Market - North Carolina - Local Produce and Crafts for Durham, Raleigh, Chapel Hill Cary and the Triangle". Archived from the original on 2011-07-10. ^ Lauren Etter (29 April 2010). "Food for Thought: Do You Need Farmers for a Farmers Market?". WSJ. ^ "IFPS FAQ". Produce Marketing Association. Archived from the original on 2009-04-20. Retrieved 2009-08-10. ^ "Farmers protest practices at the farmers markets in Manitoba". CBC News. 28 September 2017. Retrieved 15 November 2017. ^ "Farmers market lies exposed: CBC's Marketplace consumer cheat sheet". CBC News / Yahoo finance. 1 October 2017. Retrieved 15 November 2017. ^ "Tampa Bay farmers markets are lacking in just one thing: Local farmers". tampabay.com. ^ Bellemare, Marc F.; Nguyen, Ngoc (Jenny) (April 2018). "Farmers Markets and Food-Borne Illness". American Journal of Agricultural Economics. 100 (3): 676–690. doi:10.1093/ajae/aay011. ^ "America's Best Tomato Varieties". Mother Earth News. ^ "Deceptive Vendors Discovered in California Farmers Markets - Organic Authority". Organic Authority. ^ "Farmers market sees out–of–state food influx". The Independent Florida Alligator. 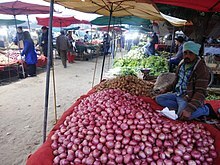 Wikimedia Commons has media related to Farmers' markets. This page was last edited on 14 March 2019, at 06:22 (UTC).